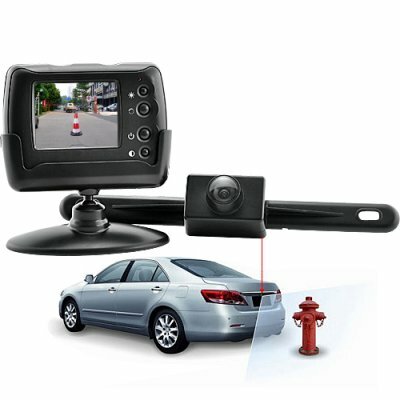 Successfully Added Wireless Rearview Parking Monitor with Wide Angle Camera to your Shopping Cart. The safest and easiest way to see what’s hidden behind when parking or reversing your automobile. This rearview monitor system is an affordable investment for any car owner and is used to minimize the likelihood of car accidents when backing up and parking. This well-designed system is complete with a high quality 2.5" wireless color LCD monitor and wide angle camera, giving you the confidence and peace of mind to safely position your car when navigating into parking spaces, parallel parking or simply reversing. Installation is quick and easy too. The wireless monitor attaches to your dash using the included velcro adhesive or screws, and power is supplied via your car’s cigarette lighter adapter or directly from the wiring system. Then the rear view camera mounts directly to your license plate and connects to your reverse parking wires. That’s all there is to it! And to make sure anyone can install this system there is even detailed step by step installation instructions included. Why risk damaging your car from unseen hazards when you can easily protect your valuable investment with the CS53? Order one today and relieve yourself of the stress and guess work of parking in tight areas, or order this product in bulk and make a great profit for your retail store or online business. The CVFU-CS53 is in stock and ready for immediate shipment. And don’t forget, all products from Chinavasion come with a full one year warranty and ship out of our warehouse within 24 hours. Video transmission is wireless so you don't have to run any wires from the camera to the monitor! Will the CS53 reverse parking monitor work in my specific make and model of car? Yes, the CS53 was designed to fit in perfectly with any vehicle.